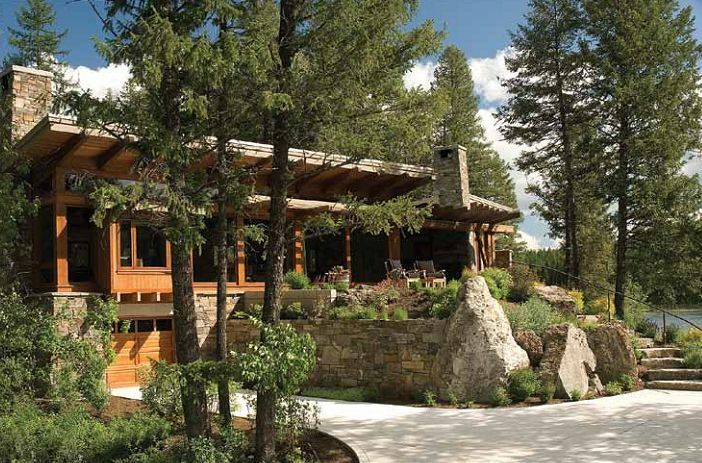 As summer returns to the Flathead, what is different about the built environment? According to local professionals, major economic changes over the past four years have definitely played a large role in different choices for financing (or non-financing), shrinking building footprints, different tastes in structural and aesthetic amenities, greater demand for efficiency and green design on a budget, and an increase in renovations and remodels. Is the market improving or simply changing? It looks like a little of both. Since the market downturn in 2008, tastes have increasingly shifted from exclusive, large-scale, trophy-style constructions toward more contemporary, minimalist, cottage-like designs and remodels. Homeowners, designers, construction and landscape professionals, and lenders have all surfed some wild economic waves and the built landscape reflects new priorities. As challenging as it has all been, there seem to be many up-sides. Regional professionals echo the same overall message – the market is steadily improving and people are tending toward designs that are smaller, simpler, and smarter. As necessity breeds invention, it also requires efficiency. As many homeowners choose to reduce the footprint of their homes, there are certain elements and amenities that are essential to any good design. For most, those include the places where everyone naturally gathers to eat, share stories, and relax together. According to Reedstrom, a certified Green Builder, energy efficiency and indoor air quality are also high on the list. Travis Denman and Hunter Dominick concur that customers still want efficiency and many benefits of green building, but don’t necessarily want to pay more for it. It’s not always about how much we have, but what we do with what we have. In a changing economy, being adaptable and part of a supportive community are key. Changes in lending practices have altered the pace and scope of many projects in the past few years, whether residential or commercial. Strong relationships with trusted colleagues, within various trades and professions, never go out of style. McDonald suggests thoughtful planning from the outset for any project. “When putting together the financing for a project, it is recommended to put a realistic number on the landscape line item. This usually means rethinking other details and shifting funds around in order to end up with a successful outcome. All too often, clients regret later the shortcuts taken at this stage. We are seeing more clientele who understand this, as many have been through the building process before.” Casey Malmquist, President of Malmquist Construction in Whitefish, sees the economic shift and changes in the field as ultimately headed in a positive direction. All-in-all, creative enthusiasm and overall morale in the architecture, design, and construction arenas seem to be definitely on the upswing along with summer’s return to Northwest Montana. Shared resilience, creative innovation, and an ongoing spirit of community are contagious. Perhaps it could be said that when times get tough, the tough get creative – and that might be one of the most truly sustainable things going.